FREE Multimedia Training: "The New Guru System"
The New Guru System: Create Information Products Worth $5,000-$100,000! Get Free Instant Access To a Complimentary MultiMedia Training. This System Reveals My 7-Step Process to Assist Coaches and Trainers to Position Themselves as The #1 Leader in Their Industry. 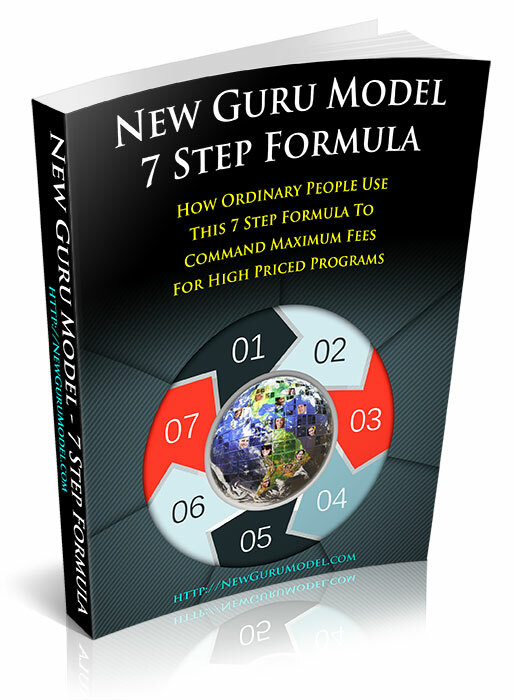 Look Over My Shoulder and See How Ordinary People Use My 7-Step New Guru Formula to FAST Create and Sell High Priced Information Products & Services from Scratch. Perfect for Start-up Businesses, Coaches and Trainers Who Want to Lead Your Industry as the #1 Positioned Company. Gain instant positioning that does NOT use today’s typical guru-model that tells you to build a traditional business funnel and other flawed advice. NOT only does this model take too long to make serious cash flow, it is fundamentally flawed in today’s over- crowded market place as you will find out. Why You MUST Watch This Multi-Media Training BEFORE Creating Or Selling Your Next Information Product Whether It Be A Book, Free Report, Coaching or Training Program. Simply put...the old guru model is too slow for today’s information explosion where 30% of the Internet is new every day! Even worse than this, today’s typical guru-model prevents you from creating and selling coaching and training programs easier than your competitors (as you will see they all are following an outdated model too! ), and this model does NOT show you how to instantly sell your information and advice for top dollar. As a bonus you will NEVER undervalue your Intellectual Property (IP) again! Understanding how to sell your advice online is one of the most exciting and profitable strategies for growing your business as an entrepreneur...but it’s also one of the riskiest if you use today’s typical guru model. In this training, you’ll see what separates a winning information product from a loser—and it’s nothing like what you will expect! And most importantly you will learn how you can develop high priced products using a new high velocity information coding system. Why EVERYONE Should Learn To Code Their Information Into $5,000-$100,000 Coaching and Training Programs. In the traditional guru model that teaches you how to stair-step your prospective clients through increasingly higher priced programs and services, what is not revealed is how to create your competitive advantage, invert your business funnel and simultaneously create your front end and back end information products simultaneously. Sure, it’s nerve-racking to play big. Sure, it’s a huge step to learn how to sell your coaching, consulting and training services for money...but as you will see, it’s even riskier to follow the typical guru model which is outdated and doesn’t reveal the precipitous downside of it: refund rates of 50-60%, how ‘flat lining’ instantly kills your business momentum, how to stand out when 30% of the Internet is new everyday...You’ll never experience these problems—and be even more confident as you play big! Not only is selling your advice a lot of fun if you follow a correct model, it also allows you to make serious cash flow no matter what the market conditions are like. This means that you will realize the tremendous up-side of knowing how to sell your iadvice for top dollar as opposed to those who don’t know how to evaluate their worth! This is why the hundreds of my clients keep this high velocity information coding strategy as their stealth weapon in their accelerated cash flow arsenal! So whether you're thinking about creating and selling information as your primary business method (or just to supplement your current entrepreneurial strategies), you'll want to check out this complimentary training on "The New Guru System" so you can learn to separate your information product creation and selling strategies from losing strategies which follow the typical guru model. This is why coaches, consultants and trainers who want to lead their industry and command maximum fees love this system!